Both such serious faces here! 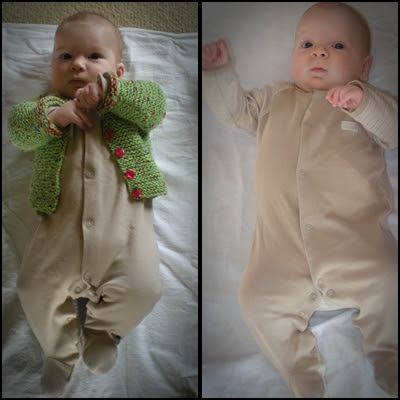 'Lil M has already out-grown that jersey, and it has been passed onto his little cousin (10 weeks younger than him)... and thankfully I put him into this little outfit now, as any later and he'd have outgrown it before even trying it! I have a gorgeous blue one we bought for Button in the same set also, which I can't wait to try on him (maybe tomorrow)! These photos kind of show you how much darker Button was to 'lil M! She is blonde as blonde can be now - but was still quite dark then, and has an olive tint to her skin (she doesn't burn despite the white blonde hair, just like her Daddy)! Lil M definitely has the fairer skin, interesting seeing as Button is fair haired too, I wonder if it will stay fair?...they are both SO CUTE!